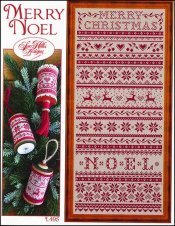 Merry Noel [J1163] - $10.00 : Yarn Tree, Your wholesale source for cross stitch supplies. Cross stitch pattern by Sue Hillis Designs. Looking for a Christmas design to stitch for you home? "Merry Noel," will get you in the holiday spirit! "Merry Christmas," is stitched at the top of this design with snowflakes, reindeer, hearts, etc. stitched below. You can take portions of this design and stitch them for Christmas ornaments. Stitch count 112W x 252L. Stitched on #4138 Zweigart Belfast Linen Raw Linen 32ct.